On this week’s Throwback Thursday we delve into the story of a man with a serious case for most fake-sounding name ever, Frank McGee. Frank “One-Eyed” McGee that is. Dramatic Reenactment. 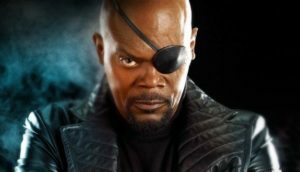 Credit: Marvel Studios. Francis Clarence McGee was born on November 4, 1882 in Ottawa, Ontario to his father (and rival fake name award nominee) John McGee and mother Elizabeth Crotty. One of nine children, Francis – or Frank – was not the only hero or athlete in the family. He also wasn’t the only tragic, early death in the family either (more on that later). 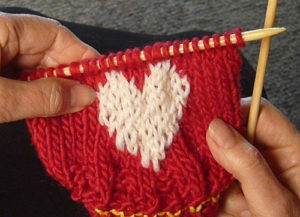 His brother Jim died while horse-riding in 1904 and his brother Charles lost his life fighting in World War I.
Frank’s childhood was also where he earned his nickname as he was unfortunately the victim of a tragic knitting accident. After graduating he began working for the Canadian Government in the Department of Indian Affairs. While doing this he continued pursuing his athletic career in both hockey and other sports. He even managed to win a Dominion Championship with the Ottawa rugby club. Around this time McGee lost the sight in his one eye while playing for Ottawa Aberdeens, a local senior (amateur adult league) team when a “lifted puck” hit him. McGee never let the injury and resulting permanent blindness in one eye deter him and went one to become one of the most prolific scorers in Stanley Cup history, including a record 14 goals in one game! This came during the famous Ottawa vs. Dawson City Stanley Cup Challenge. 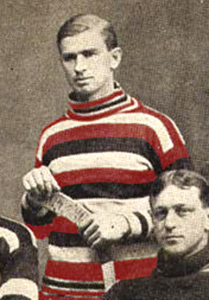 McGee only netted one goal in the first game of the two game challenge which prompted Norman Watt, a Dawson player, to say “McGee didn’t look like too much.” McGee eased into the second and final game, scoring only 4 goals in the first half (when hockey used to be played in two halves instead of three periods). He then made Watt eat his words while scoring 10 goals in the second half and setting the record for most goals in a senior hockey game at 14, on route to an easy 23-2 Ottawa win. McGee came to the historically great Ottawa “Silver Seven” club and propelled them to new heights. After his arrival to the club in 1903 Ottawa won the Stanley Cup that March and setting up an incredible win steak of ten (10!!) Stanley Cups in three years. Keep in mind at this period of time teams challenged the Cup holder to a series with the winner being the new Stanley Cup winner until another suitable challenger emerged. This means McGee and his team successfully defended nine challenges in a row. For reference of how dominant McGee and the Silver Seven were during this streak, let me walk you through how the challenge streak played out, my friend. 1) 9-1 total goals victory (two games) over the Montreal Victorias. 2) 10-4 total goals victory (two games) over the Rat Portage (now Kenora)Thistles. 3) 13-7 total goals in a best-of-three victory over the Winnipeg Rowing Club. 4) 15-5 total goals victory (two games) over the Toronto Marlboroughs. 5) 5-5 total goals victory over the Montreal Wanderers after the Wanderers forfeited the series when the refused to play the second game. 6) 15-6 total goals victory (two games) over the Brandon Hockey Club. 7) 32-4 total goals in best-of-three victory over the Dawson City club. 8) 12-15 total goals in best-of-three victory over the Rat Portage Thistles. Rat Portage won the first game 9-3 with McGee unable to play due to a broken wrist. McGee returned and Ottawa won games two and three. 9) 28-14 total goals victory (two games) over Queens University. 10) 14-7 total goals victory (two games) over the Smith Falls hockey club. -Ottawa outscored opponents 153 to 68. This is an average of over 15 goals a series. -McGee himself scored an unbelievable 63 goals in 22 games, or 2.86 goals a game. The 63 goals in Stanley Cup Finals matches is an all-time record that is likely untouchable. -McGee set the record for most goals in a Stanley Cup Finals game (14) and series (15) in the series against Dawson City. -McGee also scored 8 of the goals in a row – he scored all eight in only nine minutes as well. -The record before the 14 goal outburst was 5 goals in a game, which McGee set in the Cup Final challenge against Toronto and later matched against Brandon. -During this time Ottawa won their senior league, the Federal Amateur Hockey League as well, with McGee scoring 17 goals in only 6 games. -In the series against the Rat Portage Thistles, McGee covered up his broken wrist with a wrap and put a cast on his forearm to draw attention away from the wrap and real injury. After missing the first game, he returned for the second and third games, which Ottawa won 4-2 and 5-4. he scored the series-winning goal in game three – with one eye and a broken wrist? -One of the Stanley Cup’s most famous stories comes from the Ottawa Silver Seven, who tried (unsuccessfully) to drop kick the Cup over the Rideau Canal in Ottawa. 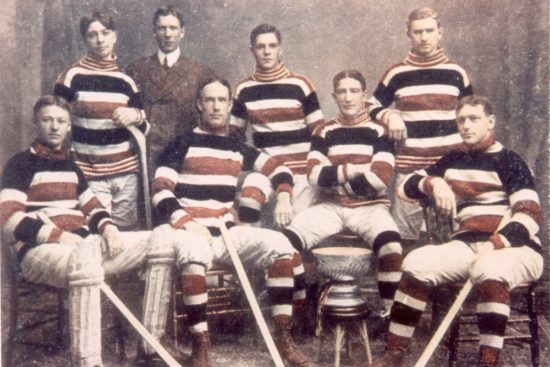 Ottawa’s legendary run would come to an end in March of 1906, almost three years to the date of its start. After falling behind 9-1 after the first game of the two game, total goals series against the Montreal Wanderers, Ottawa jumped out to a 9-1 lead in game two to tie the series briefly. Hockey great Lester Patrick then scored two late goals for Montreal to bring the loss to 9-3, but the overall series to 12-10 for Montreal. McGee scored two goals in the final game, which turned out to be his last. Frank’s vision was listed as “good” despite being completely blind it one eye. 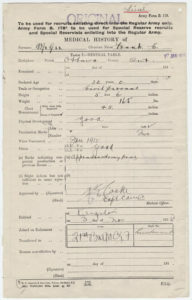 Record from Library and Archives Canada/Soldiers of the First World War. This is where the tragic ending I mentioned earlier comes into play, as well as the end of this article. Remember how I mentioned Frank’s brother Charles died in WWI? Frank was also assigned to the front lines. He was actually injured in battle and needed seven months recovery at one point, but refused a desk job for the army after his recovery, He requested to be sent to the front again so he could be there for the Battle of the Somme, or the “big push” as he said The Somme was one of the deadliest battles in WWI and Frank was no luckier than a lot of the heroes that died during the battle. Frank was killed in action near Courcelette, France on September 16, 1916. Frank “One-Eyed” McGee, Stanley Cup scorer extraordinaire, was inducted into the Hockey Hall of Fame posthumously in 1945, the first class to ever be inducted into the Hall of Fame.